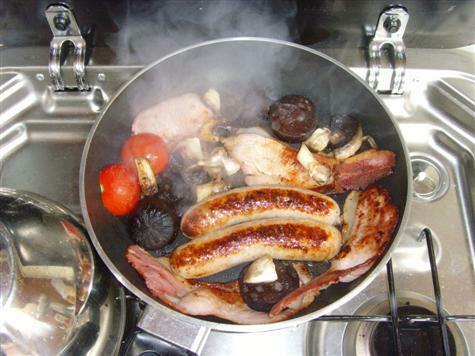 “The important thing with a Welsh breakfast is that all the ingredients are Welsh. We use organic Welsh eggs and bacon – it’s important that it’s dry cure organic bacon. “I admit the tomatoes aren’t always Welsh, but they are organic. We then top it off with a Penclawdd cockle and laverbread cake. Nice……..! Cllr. D. Williams presented his report on matters relating to the Harbour and Pier. Information was given on the current situation regarding the restoration of the ‘Charles Henry Ashley’ Lifeboat. 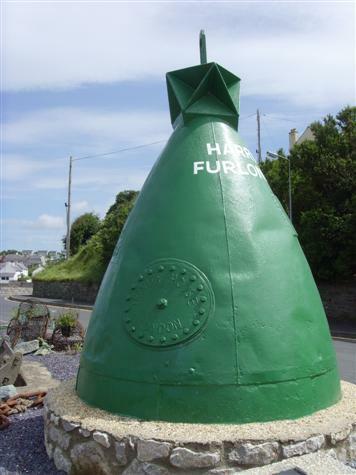 Details were given on the developments regarding the ‘Harry Furlong’ buoy and the new Information Board which will be located by the Pier……..so there !! The model of above hired for a trip to North Wales, Anglesey and Holyhead. 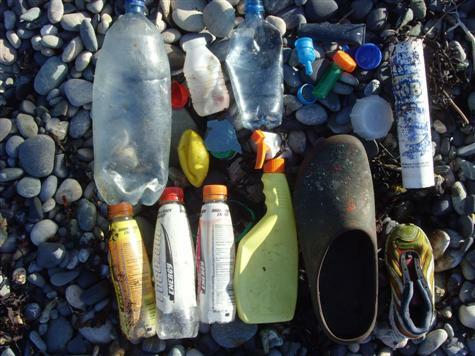 I’ve seen a fair bit of the coast line from a kayak, so decided to take a tour by land! Llanddwyn Island (Ynys Llanddwyn) is a magical place. 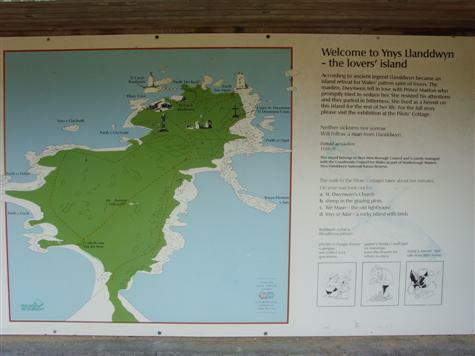 Located at the far end of a pleasant beach near Newborough Warren, this narrow finger of land is an ideal picnic site during fine weather, but also an exhilarating place when the winter winds blow. 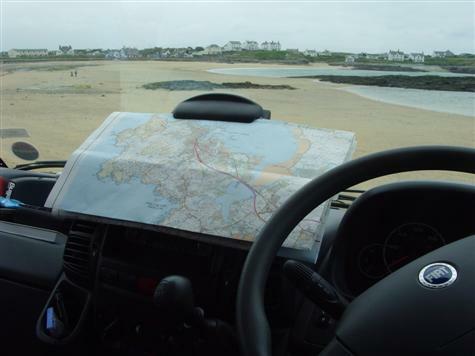 Its rolling dunes, large rock outcrops and mixture of historic buildings makes it an ideal place for an afternoon of exploration. Llanddwyn is not quite an island. It remains attached to the mainland at all but the highest tides. 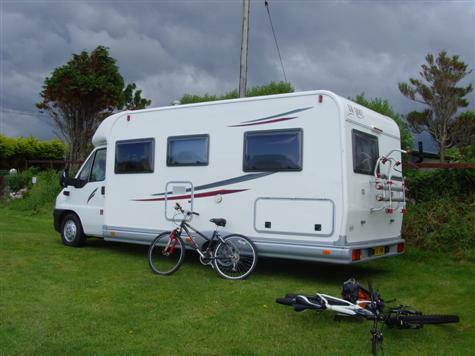 It provides excellent views of Snowdonia and the Lleyn Peninsula and is part of the Newborough Warren National Nature Reserve. 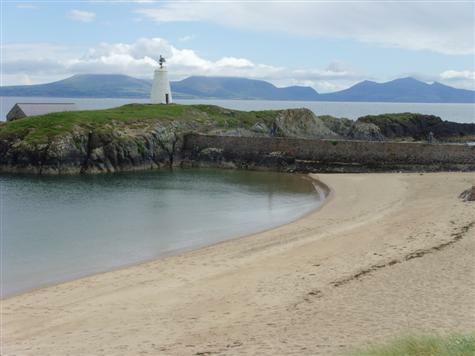 Llanddwyn Island is situated near the southern entrance to the Menai Strait. As a result it became important as shipping of slate from the ports of Bangor, Caernarfon and Felinhelli increased. A beacon, called Tŵr Bach, was built at the tip of the island to provide guidance to ships heading for the Strait. Another more effective lighthouse, Tŵr Mawr, which was modelled on the windmills of Anglesey, was built nearby in 1845. The older lighthouse has now returned to service after a modern light was placed on top. During this time cottages were built near the towers to house pilots who guided ships into the Strait. 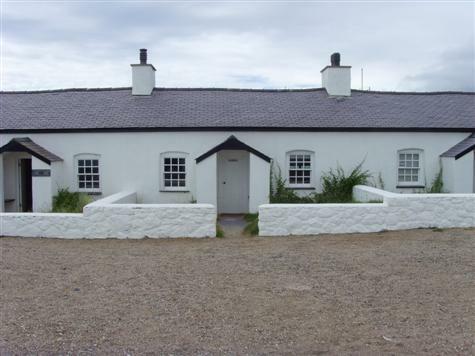 Two of these cottages have been restored, with one housing an exhibition about the local wildlife. From 1840 a lifeboat was also stationed there. 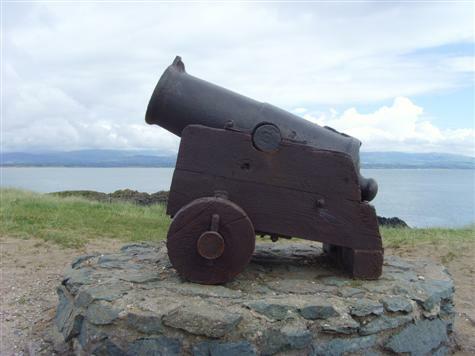 It was manned by the pilots as well as volunteers from Newborough; the cannon that was used to summon the lifeboat crew can still be seen near the cottages. During its time up to the closure in 1903 the lifeboat from here saved 101 lives in 35 separate incidents. The cannon that was used to summon the lifeboat crew can still be seen near the cottages. 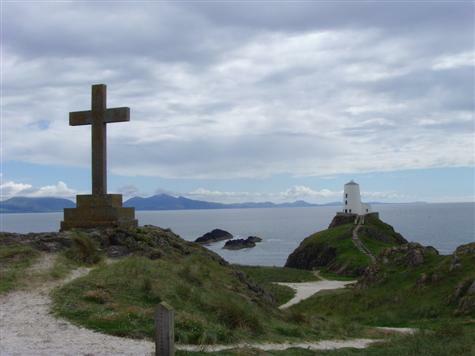 The name Llanddwyn means “The church of St. Dwynwen”. She is the Welsh patron saint of lovers, making her the Welsh equivalent of St. Valentine. Her feast day, 25 January, is often celebrated by the Welsh with cards and flowers, just as is 14 February for St. Valentine. Dwynwen lived during the 5th century AD and was one of 24 daughters of St. Brychan, a Welsh prince of Brycheiniog (Brecon). She fell in love with a young man named Maelon, but rejected his advances. This, depending on which story you read, was either because she wished to remain chaste and become a nun or because her father wished her to marry another. She prayed to be released from the unhappy love and dreamed that she was given a potion to do this. However, the potion turned Maelon to ice. She then prayed that she be granted three wishes: 1) that Maelon be revived, 2) that all true lovers find happiness, and 3) that she should never again wish to be married. 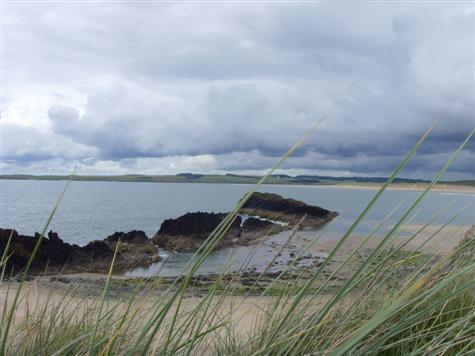 She then retreated to the solitude of Llanddwyn Island to follow the life of a hermit. 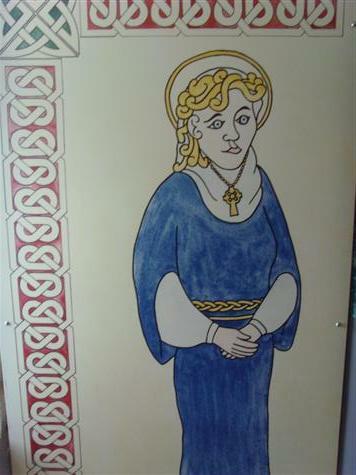 Dwynwen became known as the patron saint of lovers and pilgrimages were made to her holy well on the island. It was said that the faithfulness of a lover could be divined through the movements of some eels that lived in the well. This was done by the woman first scattering breadcrumbs on the surface, then laying her handkerchief on the surface. If the eel disturbed it then her lover would be faithful. Visitors would leave offerings at her shrine, and so popular was this place of pilgrimage that it became the richest in the area during Tudor times. This funded a substantial chapel that was built in the 16th century on the site of Dwynwen’s original chapel. The ruins of this can still be seen today.